On August 15, 1947, the sun finally set on the British empire in India. It was a heady, and tumultuous day. Indians were delirious. They rejoiced on the streets, waved the saffron-white-green and wept over Nehru's speech. Phillips Talbot, then South Asia correspondent for the Chicago Daily was a witness to this historic day. In a vivid letter to a friend in New York, he conveyed his impressions of India's first taste of freedom. Currently president emeritus at the Asia Society, New York, Mr Talbot granted Rediff On The NeT permission to use this letter from his archives. These have been five delirious, tumultuous days. In city after city lusty crowds have burst the bottled-up frustrations of many years in an emotional mass jag. Mob sprees have rolled from mill districts to gold coasts and back again. Despite doubts about the truncated, diluted form of freedom descending on India, the happy, infectious celebrations blossomed in forgetfulness of the decades of sullen resentment against all that was symbolised by a sahib's sun-topi... in Delhi, Bombay, Calcutta and probably other major cities, celebrating crowds numbered in the hundreds of thousands. Some days earlier astrologers had discovered that the morning of August 15-the day designated for the transfer of power was an inauspicious time. Partly for this reason and partly because they were well aware of the drama of the occasion, Congress leaders decided on a midnight session of the Indian Constituent Assembly to assume authority at the stroke of 12. The programme was carried out to the letter inside the brightly-lit hall. 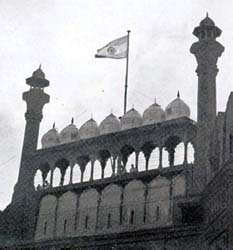 New national flags-saffron, white and green with a blue Ashoka wheel of life in the center- hung in the chamber and against the wall panels that formerly held portraits of British viceroys. All India Radio and the BBC had their microphones and sound cabins in place. Guests crowded the galleries and overflowed onto the sides and back of the floor. Members' families, diplomats, officials, press men, and all others who could wangle tickets were there. 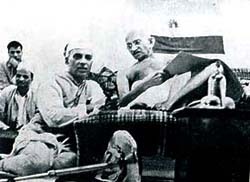 Inspired by the date, the hour and the crowd, Jawaharlal gave another and perhaps the best of the sensitive, heart-warming, destiny-conscious speeches that have marked his public life this year... As the chimes of midnight were broadcast an excited Hindu member blew the conch to call the gods to witness the occasion. 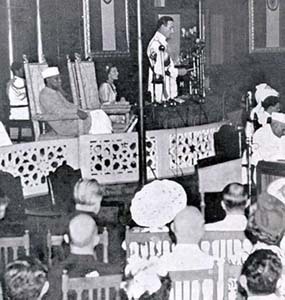 All members rose at the same moment to pledge themselves to the service of India, and the Assembly was duly declared the sovereign body of the just-born Dominion. That was the scene inside the Assembly chamber. Outside, in the streets leading around the circular building, new bedlam had broken loose. Earlier in the evening Mildred and I had ridden with a wild taxi driver down Chandni Chowk, one of the famous trading streets of Asia. The happy crowds there had given me the first inkling that this would not be like Karachi; they also furnished the first tip that Hindus, Muslims and Sikhs were celebrating happily together. Outside the Assembly building the scene was the same. It was Time square on New year's eve. If that day, begun in Karachi and ended in Delhi, was a study in contrasts, the next was a panorama of mass enthusiasms. The official programme included the swearing in of the governor general and the ministers at Government House, a special Constituent Assembly meeting that culminated in the breaking of the national flag over the Assembly building, a public flag-raising in the afternoon, and an evening reception by the Mountbattens for several thousand people. The beginning, at least, was orderly. For hundred invited guests gathered in the high-vaulted, marble-columned durbar hall of the ex-viceroy's house, now called Government House. They watched the Mountbattens, both consciously resplendent in white, march in procession to the thrones where, only 20 weeks before, the viscount had been inducted to the viceroyalty. As before, the dress-uniformed bodyguard lancers stood at attention and bugles rang through the hall. But this time Mountbatten had come to surrender power. After being sworn in as a constitutional governor general (his commission as viceroy having lapsed the night before) he administered the oath of office to Nehru as the first prime minister of self-governing India, and to other ministers. The contrast between the admiral's white uniform, bedecked not only with many medals but with the blue sash of the Order of the Garter, and the dhoties and shirts worn by some of the ministers was more striking than anything we had seen in Karachi. As someone remarked, this looked like more than a transfer of power from white-faced sahibs to brown-faced sahibs. Mountbatten, who in Karachi had formally relinquished authority to Jinnah, seemed much more in his element in Delhi where, with obvious popular support, he would remain for some months as governor general. His inaugural speech to the Assembly reflected the warmth and enthusiasm with which he had guided the Indian leaders to this day. He was a symbol, yet the people were cheering something far greater.